There are heaps of lessons rescue dogs can teach us and their canine companions, even if they’re complete clowns like Bandit. Before Bandit came along, Shiv was convinced he was human. A rescue dog of sorts himself, he’d spent the first four years of his life in the backyard of a family home, surrounded by five boisterous kids all under the age of ten. Constantly getting harassed by the youngsters and never getting a walk to the park to meet other dogs, he was a rather confused and stressed out ball of fluff. When the family decided they didn’t want him anymore, Layla jumped to the rescue and took him home. “Understandably, little Shivs didn’t have a particularly good view of people. It took a long time before he even came out from under the bed!” Layla recalled. Having never been around other dogs, Layla wasn’t sure if he even knew he was a dog and thought he would benefit from a pooch pal. “They could play together, sleep together, be cheeky together and do all the things that dogs do. At least that was the idea I had in my head,” Layla exclaimed. 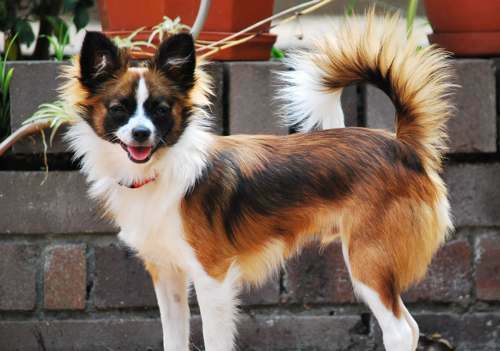 When Layla found five-month-old Bandit, a Papillon x 'African wild dog' while searching PetRescue.com.au, she thought he’d make the ideal companion for Shiv. “He was so calm and cute when we first got him home! But once he settled in, he let his inner puppy loose and WOW, things got crazy!” said Layla. Two months on and Bandit’s already kicked all the silly habits. His playfulness has given timid little Shiv a second chance at enjoying puppyhood, shaping him into a wonderfully calm and cuddly dog. “Bandit has given me and Shiv so much love and laughter. He’s still a bit cheeky, don’t get me wrong, but he is such a clown you can’t help but laugh!” said Layla.